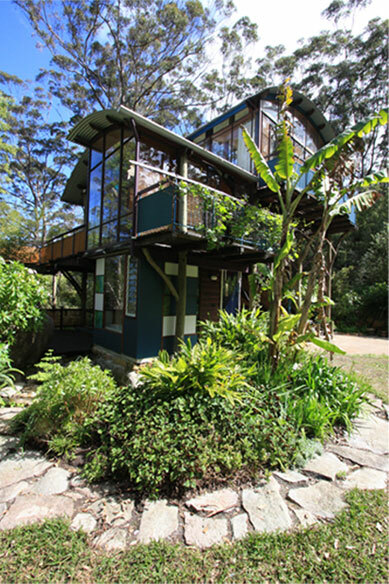 Skyhouse Retreat is inspirational holiday accommodation situated amongst ancient karri trees, high on Weedon Hill, Denmark, Western Australia. With decks adjoining every room, the sounds, smells and sights of the surrounding forest are always only a few steps away. When you live in the Skyhouse only floor to ceiling walls of glass separate you from nature's ever changing panorama. Birdlife abounds on Weedon Hill. From the tiny speckled Pardelotes that dig burrows in the ground to live in, to the majestic Sea Ospreys whose enormous nests are over a metre across. This you can all see. The building's unusual pole frame construction of hardwood poles and beams - it's sturdy 'inner skeleton' allows it to have external walls that seem to almost not be there. The curved roofs float above the walls appearing to be hardly attached at all. This results in a habitat that is light, whimsical, unexpected and truly organic. Find out more about the Comforts of Skyhouse Retreat or visit our Booking Page to make a reservation.